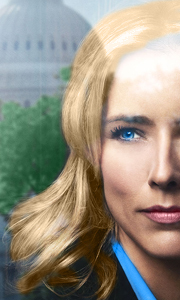 Meet Elizabeth McCord (Tea Leoni): wife, mother, Ph. D., former CIA analyst...and now, America's newest Secretary of State. She left the world of covert intelligence behind for ethical reasons to lead an academic lifestyle with her supportive husband Henry (Tim Daly) and her teenage children. Now the President needs her, and he knows from experience that Elizabeth has the knowledge and tenacity to advise on and steer the nations foreign..
All 23 episodes from the second season of the American political drama starring Téa Leoni as US Secretary of State Elizabeth McCord. As part of her role, Elizabeth comes up against a whole range of foreign and domestic problems while often clashing with her fellow senior staff. In this season, Elizabeth is forced to briefly step in as President following a host of medical emergencies and she must negotiate the safe return of a colleague..
Own Madam Secretary Series 3 DVD from Deff, DVD, Blu-Ray & 4K Video Specialists - Free UK Delivery..
Own Madam Secretary Season 4 DVD from Deff, DVD, Blu-Ray & 4K Video Specialists - Free UK Delivery..